Another famous episode in the career of Go Seigen is his game against Honinbo Shusai. In order to make plain what was so special about this game, first a little bit of go history. The start of professional go in Japan was approximately contemporaneous with the battle of Nieuwpoort, around 1600, and it began with the Buddhist monk Nikkai. Nikkai was the first head of the Honinbo go school. In 1612, the authorities began officially to sponsor the four greatest go schools: Honinbo, Yasui, Inoue and Hayashi. The Honinbo school had the leading position, thanks to the overwhelming strength of Nikkai. In 1588 he was able to win a tournament organised by the government. It brought him a fixed annual income, paid by the Shogun. The name Honinbo, incidentally, comes from a pavilion on the land of a temple in Kyoto where Nikkai lived. When the capital was moved to Tokyo in 1603, Nikkai had to go along. Once arrived there, he made a title of the name Honinbo and changed his name to Honinbo Sansa. He is best known by this name. In Tokyo he received an established post and he was, amongst other things, responsible for the spread of go in Japan. He took this very seriously. It is Honinbo Sansa and his school that Japan must thank a great deal for the level at which go is played at present. The supremacy of the Honinbo school was off and on in danger, but even when the authorities stopped sponsoring go in 1868, the Honinbo school still supplied the strongest go players. This was in spite of the problems and reverses, the lack of income and accommodation. It seems that later there was talk of a certain sclerosis of playing techniques precisely because the Honinbo school always stood at the top. Dogmas arose: specific opening moves, for instance, were marked down as good or bad. Moves rejected by the Honinbo school normally never appeared on the board in professional games. When Go arrived in Japan, the Honinbo school was still the leader of the go world. The prestige of the head of the school, Honinbo Shusai, was enormous - the more so because Shusai had acquired, in addition to the title of Honinbo, the highest possible of Meijin (master). 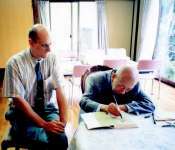 Through his position, Shusai represented centuries of go wisdom and tradition. Go Seigen was unintentionally to be cast in the role of braggart and rebel - a role which by no means suits this especially friendly and mild-mannered man, and which he himself had never knowingly sought. The game between Go Seigen and Honinbo Shusai, which at the time was regarded by everyone (and by some still is) as the game of the century, began on 16 October 1933 and lasted almost three months. The actual playing time, the time that both participants actually sat at the board, was 14 days. the newspapers had considered that it would be good for circulation to publicise this game widely as a confrontation between Japan and China. As a result, Go was often troubled by nationalists and the windows of his house were smashed in. "I have never taken much part in politics or the like. This was not the first time that I was an accessory to events in which emotions ran very high." Go had to put up with this inimical atmosphere for three months. As nominally the stronger player, Shusai had the privilege of deciding whenever the game should be adjourned. Because, at the time, there was no sealing of moves, it meant that the player whose turn it was to move could continue to study the position leisurely at home. Shusai made shameless use of this privilege. Thus it came about that, at the resumption of play on the eighth day, Shusai played first, Go answered within two minutes, and Shusai then thought for three and a half hours, only to adjourn the game. Go was thus at a particular disadvantage. It is therefore not surprising that, whenever the ideal duration of a game comes up for discussion, Go has a very forthright opinion. A game must, one way or another, be completed in one day. "Cho Chikun lost yesterday because he had selected a large-scale, difficult joseki,"
said Go, by way of explanation. "That is precisely what is wrong with go in Japan today. They are too attached to corner patterns (josekis). Go ought to be played on the whole board. And why Cho is using all is time on one joseki in a game with three hours thinking time is a mystery to me." Go's unorthodox style attracted much attention. He was the darling of the newspapers, which recorded top sales during the match between Go and Shusai. His opening move at 3-3 was unheard of for a professional. Go: "Everyone said a move on the 3-3 point was bad and could not be played. I simply did not understand that, and wanted to see for myself why it was supposed to be bad." In the end, Shusai won the game by two points. But there is yet another remarkable story attached to the game. It is on account of White's move in Diagram 1, a brilliant move that made a significant contribution to Shusai's victory. It was an open secret that Go in fact had to take on the whole Honinbo clique at the same time. Whenever Shusai had adjourned the game, he studied the position with his students to find the best move together. The story is that White's move in Diagram 1 was a brilliant discovery by one of Shusai's pupils: none other than Maeda Nobuaki, who became famous for his books on tsume-go (go problems). This move, which at a stroke brings White back into the game, was therefore apparently not thought of by Shusai himself. Go's teacher, Segoe Kensaku, let drop years later, according to what he assumed was an "off-the-record" conversation in a bar, that White 1 was a move by Maeda and not by Shusai. When this pronouncement appeared in a newspaper the next day, the whole Honinbo school was furious, and Segoe had to bear a very heavy burden. Every day he received threatening letters, and a band of supporters of the Honinbo school bent on revenge even posted themselves in front of his house. Eventually he had to give up his post on the board of the Ki-in and make a public apology. "I am very sorry that there were some things I did not realise until later," said Go. " Honinbo Shusai and my teacher were definitely not bosom pals, but that went totally over my head. "In an interview in the 1980s, he said,"Only years later did I come to know that Segoe had made that statement, and that he therefore had to endure so much." "Was Honinbo Shusai a villain? He was a scoundrel! How the Ki-in manages to deify this person of all people is unbelievable!" "A villain. He was a villain! He is now praised to the skies by the Ki-in and depicted as one of the heroes of this century, yet - mark you well - he sold his title to the newspapers for mere lucre and bought with it a fair-sized piece of land in Tokyo without giving one cent to the Ki-in or the go world." Translated, with permission, by John Fairbairn from the magazine "Go" of the Dutch Go Federation (Nederlandse Go Bond), Vol. 36 Nos. 5 and 6. Thanks are due to Theo van Ees for supplying this source material.